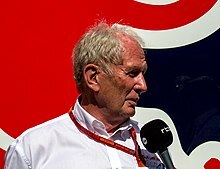 Helmut Marko LL.D., (born 27 April 1943) is an Austrian former professional racing driver and current advisor to the Red Bull GmbH Formula One Teams and head of Red Bull's driver development program. Born in Graz, Austria, Marko was a school friend of Jochen Rindt, who was to become Formula One world champion in 1970. Marko competed in several race series, including 10 Formula One Grands Prix in 1971 and 1972, but scored no World Championship points. At the Targa Florio, he drove the fastest laps around the 72 km Sicilian mountain circuit in the 1972 race, catching up over two minutes on the leader within two laps to finish second by a mere 17 seconds. His fastest lap in the Alfa Romeo 33 was 33 min 41 sec, at an average of 128.253 km/h. A few weeks later on 2 July, during the 1972 French Grand Prix at Clermont-Ferrand, a stone thrown up by Emerson Fittipaldi's Lotus pierced Marko's helmet visor, permanently blinding his left eye and ending his racing career. Marko became a doctor of law in 1967. He owns two hotels in Graz – the Schlossberghotel and Augartenhotel. He was manager for Austrian racing drivers Gerhard Berger and Karl Wendlinger for some years before setting up and running RSM Marko in 1989, a race team competing in Formula 3 and Formula 3000; running under the name Red Bull Junior Team from 1999 onwards. From 1999 he has also overseen the Red Bull driver development programme, which has steered drivers such as Sebastian Vettel, Daniel Ricciardo and Max Verstappen into Formula One. Since 2005 he has been advisor to the Red Bull Racing Formula One team. ^ Völker, Herbert. "The First Formula One Pop Star". The Red Bulletin September 2010. Red Bull Media House GmbH. Retrieved 25 March 2013. ^ Örnerdal, Stefan. "56th Targa Florio 1972". Formula 2 Register. Retrieved 25 March 2013. ^ A Era dos Campeões (DVD). Hangar Filmes. ^ Williams, Richard (14 November 2010). "Red Bull's Dr Helmut Marko, the mastermind behind Sebastian Vettel". The Observer. London: Guardian News and Media Limited. Retrieved 13 December 2011. ^ "Charade". racingcircuits.info. Retrieved 10 April 2017. ^ "The Volcanic Rush of Clermont Ferrand". speedhunters.com. Retrieved 10 April 2017. ^ Völker, Herbert. "Die Diagnosen des Doktors". Zeit Online. ZEIT ONLINE GmbH. Retrieved 27 June 2013. ^ Small, Steve (1994). The Guinness Complete Grand Prix Who's Who. Guinness. p. 245. ISBN 0851127029. This page was last edited on 6 April 2019, at 10:56 (UTC).